Previous work has examined whether pitch and rhythmic elements of music are processed independently. The current study investigated whether the absence of structure in one of these dimensions affects perception in the other dimension. This study used melodies from the Montreal Battery of Evaluation of Amusia (MBEA). Melodies for the Tonal/Regular condition were used in their original form. Pitch manipulations of the original melodies created atonal melodies for the atonal conditions. Likewise, rhythm manipulations created irregular rhythms for the irregular conditions. Each condition had melodies with pitch changes and rhythm changes. Full sets of the stimuli can be downloaded below. This graph shows the proportion of correct responses by participants for both pitch discrimination and rhythm discrimination tasks. Participants indicated whether the second melody was the same or different from the first. Asterisks show significance, error bars represent standard error of the mean. In the pitch task, participants performed better in the tonal conditions compared to the atonal ones. In the rhythm task, participants performed better in the regular conditions compared to the irregular ones. 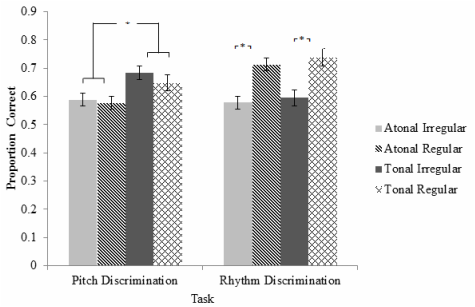 There was no effect of rhythm in the pitch task, and no effect of pitch in the rhythm task. These results suggest that an absence of structure in the irrelevant dimension does not affect ability to discriminate differences in the relevant dimension.